When it comes to seeing the very small, transmission electron microscopes can be big. They have been used to image crystalline metal samples with subangstrom resolution, far better than the hundreds of nanometers of resolution possible with standard light microscopy. But because of the nature of unstained biological samples, the transmission electron microscopy resolution for them is worse by a factor of as much as 50, and researchers have had to live with fuzziness. This phase plate helps improve contrast when imaging biological samples with transmission electron microscopy. It was manufactured at the Lab for Electron Microscopy and at the Center for Functional Nanostructures at Technical University of Karlsruhe in Germany. Photo by K. Schultheiß / D. Gerthsen. Now a team from Max Planck Institute of Biophysics in Frankfurt, from Technical University of Karlsruhe and from Carl Zeiss SMT in Oberkochen, all in Germany, has used the latest nanofabrication techniques to implement electron microscopy phase contrast imaging. Transmission electron microscopy (TEM) offers very high resolution when compared with visible techniques because the wavelengths of the electrons used for imaging are orders of magnitude smaller than the wavelength of visible light. In practice, the resolution is less than ideal because of the quality of electron lenses and problems with electron wave coherence, but it is still far better than what can be achieved with light microscopy. Biological samples such as protein complexes, DNA and cell membranes, however, introduce additional imaging hurdles. Because they are full of carbon, oxygen, nitrogen and hydrogen — all low atomic number elements — such samples impose only small phase shifts on the electron wave as it passes through them, leaving the amplitude unchanged. This behavior makes these weak-phase objects very hard to image. 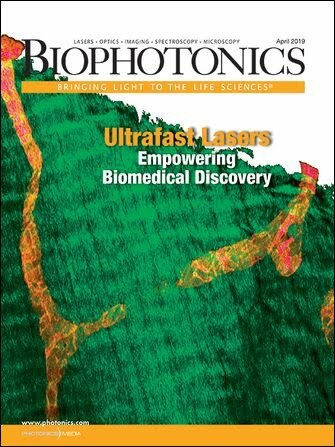 Rasmus R. Schröder, senior scientist at Max Planck Institute and leader of the project, likened it to bright-field light microscopy imaging of unstained live cells. One of the solutions to this problem has involved defocusing the image, which increases contrast but adds artifacts. These errors can be corrected, in principle, by combining information from many different images of the sample. However, the process is often inaccurate because the individual defocused images are very noisy. Biologists also may want to look at structures that cannot be averaged, such as an individual cell. In addition, the standard preparation procedure in electron cryomicroscopy for an unstained biological sample makes the task even harder. Researchers embed the specimen in a thin layer of ice and cool it with liquid nitrogen or helium during imaging, a process that makes collecting multiple shots problematic. “Such samples are extremely sensitive to electron radiation, so that images have to be recorded with a limited electron dose,” Schröder explained. The researchers, therefore, took a different approach and developed what they dubbed a phase contrast aberration corrected electron microscope (PACEM). The analogy in the visible realm is phase contrast light microscopy. Whether using photons or electrons to image, contrast can be thought of as the result of the scattered and unscattered wave producing the image wave. In simple scattering, the two are orthogonal, or at right angles, to each other, and the resulting contrast is poor. On the other hand, if the phase of either the scattered or unscattered wave is shifted 90° relative to the other, the two will be aligned and contrast maximized. In previous attempts at phase shifting the unscattered wave, carbon films or similar materials have been inserted in the imaging path, but these are unstable because of the beam. So this team turned to an old idea, an electrostatic phase plate for transmission electron microscopes. The concept was first proposed by Germany’s Hans Boersch in 1947, but at the time it could not be implemented because the back focal plane of the objective lens in an electron microscope typically measures only 30 to 50 μm across, and the dimensions of any phase plate for electron microscopy have to be in this range. The micro- and nanofabrication techniques required to build such tiny devices have become available only recently, Schröder noted. The researchers combined electron beam lithography, thin-film evaporation and focused ion beam milling to produce electrostatic phase plates made of a thin silicon nitride film, coated on one side with gold. After depositing a gold contact on the other side, they created a 50-μm opening in the membrane, spanned by three legs a few microns wide that met in a central junction. One leg supported the gold contact. They coated all the legs with insulating aluminum oxide, covered everything with another layer of gold and drilled a small central hole in the phase plate. 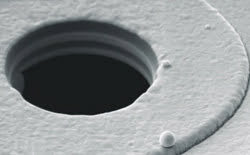 The nanofabrication techniques enabled working electrostatic lens structures of 1 μm in diameter, with 2.5-μm supporting structures. The fabrication process and a noncentrosymmetric phase plate geometry are patent-pending. When a voltage is applied to the electrode, the unscattered electrons can be phase-shifted relative to the scattered ones. And the voltage allows the phase shift to be tuned and the contrast boosted to the fullest. Tests of the structure showed that a phase shift of 90° could be achieved. Imaging of protein crystals showed that the electrode improved contrast. Besides biological samples, other weak-phase objects are thin amorphous films, magnetic domains, and samples containing small voids or gas bubbles. TEM imaging of these could benefit from the phase plate technology. With a phase plate and corrected electron optics, the researchers believe that a resolution of 3 to 6 Å should be achievable routinely — a huge improvement. Gerd Benner, manager of research and development of transmission electron microscopes for Carl Zeiss SMT, noted that the PACEM project also includes the development of a diffraction plane magnification unit. Once accomplished, this advance will magnify the diffraction plane and lessen the miniaturization demands on the electrostatic lens and its supporting structures. He added that Carl Zeiss tries to develop technologies that have a high likelihood of appearing in future products, and the company is confident that PACEM or modules within it will show up in commercial offerings, but it is too early to tell when that might be. “However, we are convinced, when applications prove our concept and improved results are obtained, a high market demand for this new imaging method will arise,” he said. Contact: Rasmus R. Schröder, Max Planck Institute of Biophysics; e-mail: rasmus.schroeder@mpibp-frankfurt.mpg.de; Gerd Benner, Carl Zeiss SMT; e-mail: benner@smt.zeiss.com.